Today, I’m so excited to bring you the duo of my friends and dear clients Lizanne Corbit and Paula Friedland. 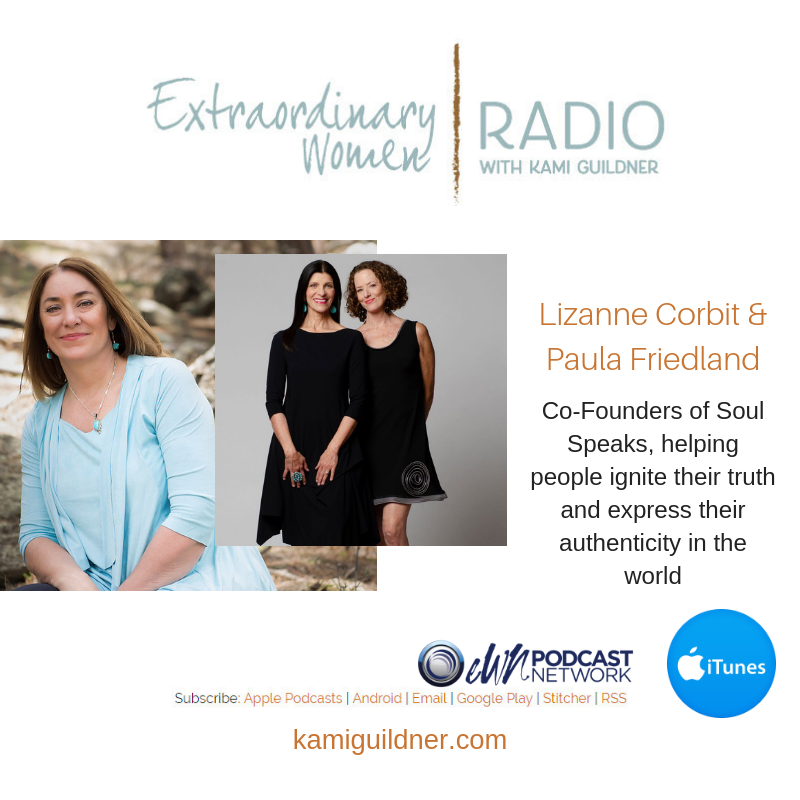 Lizanne and Paula are the co-founders of Soul Speaks, a transformational process to help people ignite their truth and express their authenticity in the world. I have experienced their work personally, and it’s magical. I love these two women – in addition to running their own successful personal growth businesses – they have found a way to weave their art into all that they do. As you’ll learn in this interview – their art is an essential element of their gift to the world. Lizanne and Paula will be guest speakers at my Extraordinary Women Ignite event coming up on November 1-3! I invite you to join us! Three days focused on raising up your voice, visibility and business. Tickets are available at here. In our interview today, we talk about women finding their their sacred roar and having the courage to speak their truth. Both Lizanne and Paula have heart-touching stories to share that have guided them on their journey to their success today. And they each share their special gifts and artistic talents! Lizanne shares her poetry and Paula her music! Soul Speaks is a transformational, dynamic and extraordinary life changing process. Foundationally, it is a unique approach to overcoming the fear of public speaking; but the benefits go way beyond that. Soul Speaks teaches people how to speak powerfully and authentically in any area of their life, allowing them to bring their voice into the world and enhance their ability to speak and live their truth every day. Lizanne Corbit is a psychotherapist who helps her clients answer the call to be more of who they are. Through her individual work, women groups, workshops and retreats, Lizanne teaches you how to navigate the crisis of life and own your unique brand of brilliance. As a heart warrior, soul nurturer, rebel poet and midwife to the spirit. Paula Friedland has been a counselor, certified coach, public speaker and trainer for the past 17 years — including seven years as a coach for the Tony Robbins organization. She helps people heal “laryngitis of the INTERNAL voice” and to recover from the paralysis that can steal what makes them unique. Before entering the personal growth field, Paula spent 13 years as an actress/singer, pursuing theater in New York City, and she brings the creativity from her years in the theater to all her work with people today. To learn more about Soul Speaks, visit their website.